One way to resolve issues which occur too many times to fix by hand in the generation script is to use a regular expression to search and replace some problematic code. 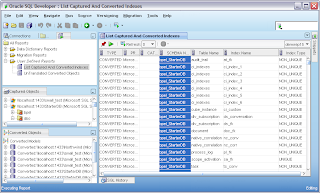 Heres a little SQL Developer user defined report to list the captured and converted indexes. You can change the query to list 1 or the other. Copy the following text and create a file called MigratedIndexes.xml with it. The In the SQL Developer User Defined Reports , Import the file. When you open the report you should choose the migration repository. A SQL Server and Sybase translation issue. If you executed a procedure from another procedure, and you specified the executed procedure parameter names, you may have got a doubling up of param names. Sybase Offline Capture Scripts on Windows are incorrect. Some files needs to replaced for them to work, the text of which can be found below. You should then be able to perform an Offline Capture successfully. The Servername must be defined in your sql.ini file for BCP to work. In the old OMWB we had a "Discover Tablespaces" feature, so that you could assign tables to existing tablespaces in your Oracle database, before generating your Database. In SQL Developer you can do this in 3 ways. But the third way may be the most useful. In SQL Developer 1.5 we have a nifty solution for moving BLOBs (Images in SQL Server and Sybase) to Oracle offline. The problem in the past was SQL Server and Sybase BCP tool dumps out binary values in HEX. HEX cant be loaded easily into a BLOB in Oracle using SQL*Loader, there are some limitations to the size of the BLOB. In the past we had a manual solution to create an extra CLOB column to load the HEX as a string/clob to . Then we had a procedure which was run after the datamove to convert the HEX to RAW piece by piece and insert it into the BLOB column. This is automated now but you have to set a preference first. 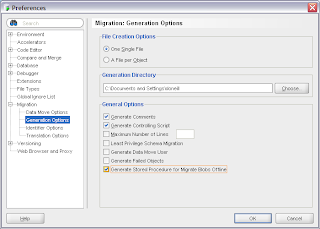 Select "Generate Stored Procedure to Migration Blobs Offline". In 1.5 by efault its off. Ill change this for 1.5.1 . Now when you move your data offline, BLOBS will be handled automatically. Sometimes you'd like to go a do a quick string search and replace of SQL for your captured triggers, procedures, functions or views. The DDL for these objects is held within different migration repository tables. You can create the following view within your migration repository and use it to update the underlying migration repository. 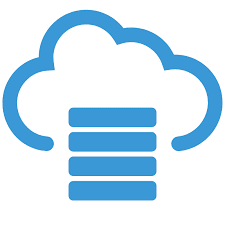 Ill outline the steps I would use to migrate a SQL Server or Sybase database to Oracle. 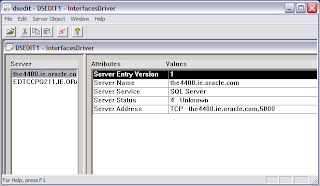 Download JTDS 1.2Download and Install Oracle XE if you dont have access to an exiting Oracle database. Some SQL Developer Migration Workbench users are experiencing issues capturing. The migration log may have a Protocol Violation exception reported. There seems to be an issue with some ORACLE_HOME versions installed on the same PC as SQL Developer. 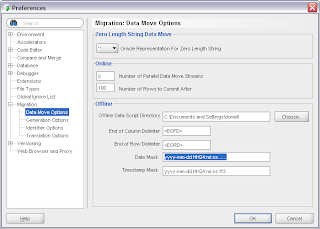 To ensure that the SQL Developer Migration Workbench uses the shipped JDBC drivers and nothing from the existing ORACLE_HOME use this little script. The workaround is to tell SQL Developer to ignore the ORACLE_HOME so that it has to reference the shipped JDBC drivers. We are looking into what causes this issue, but for the moment the above is the workaround. Bug Alert! 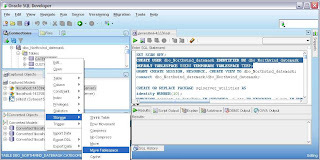 Identity Columns are not converted correctly for Sybase in SQL Developer 1.5. Heres how it should be done manually till we get it fixed. Replace columname and tablename with the identity column details. Offline Datamove involves using SQL Server/Sybase BCP tool to dump out the data in the tables into dat files. Then Oracles SQL*Loader is used to load the data into Oracle. This is the recommended approach when dealing with large datasets, as BCP and SQL*Loader are designed for datamove. 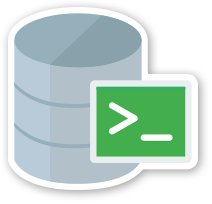 Also SQL Developer will create the scripts for you, so you don't have to manually create them. One issue that has cropped up is moving DATETIME values to DATE. SQL Server/ Sybase DATETIME has millisecond precision. Oracle has the TIMESTAMP datatype to hold millisecond values. But sometimes you just want to convert from DATETIME to DATE and ignore the milliseconds as they are not important. To do this you can specify in the date format mask to ignore any values after the second value. Use dots '.' to do this job.